The best book I read last year hands down was Shadow of the Wind by Carlos Ruiz Zafon. 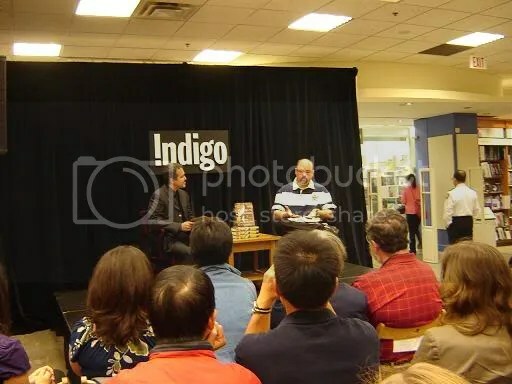 So when I was cashing out at Indigo on Tuesday and noticed that he had a new book out called The Angel’s Game, I freaked out a bit and gushed on and on about him so loudly to anyone willing to listen that the woman in front of me bought a copy. Little did I know the fun wasn’t going to end there; when I reached the desk my cash fellow told me that Carlos himself was coming to the store Thursday at 7pm. *insert red face and dying of glee here*- Clearly my fangirl abilities are far beyond my own understanding. So of course I went, books in hand with a huge smile on my face. Carlos is a really neat fellow- the best part of the entire talk was when he outright said he’d be pissed if his book was ever made into a film. (He was a screenwriter) It was nice to hear an author acknowledge that their text was made with the intention of being a book and that no film could do it justice. I dig that no amount of money will make it “worth it” for him. 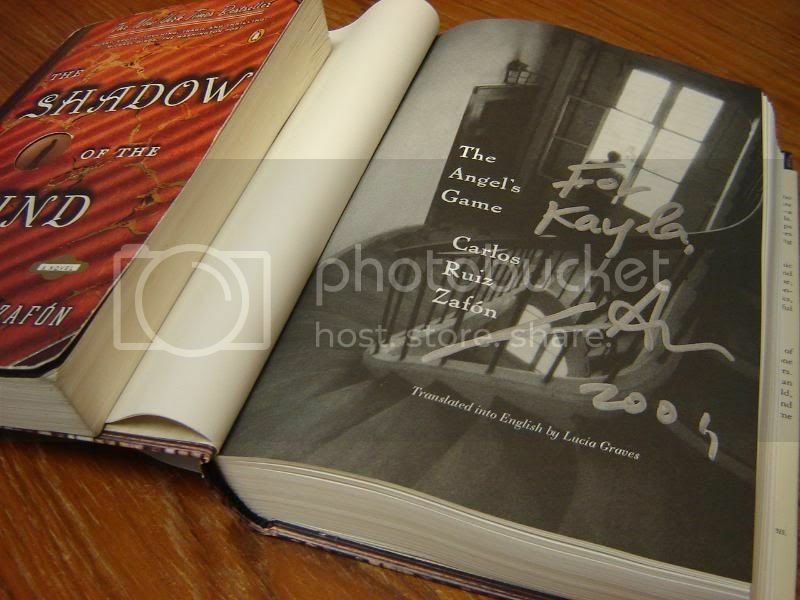 Kudos Mr. Ruiz Zafon *high five*. Also in the good news pile this week was Chris Butcher’s post on his blog Comics212 announcing that TCAF is becoming an annual event. I’m so happy about this. Just when I got heavy boots (insert nod to Safran Foer here) about having to wait until 2011 to do it again- I have a mere 10 months and wee before it all happens again! PS- I printed a bunch of my photos from Paris and a few from Puerto Plata in black and white recently in order to decorate my apartment and I posted the cream of the crop in my Photography section. This entry was posted on June 20, 2009 at 11:35 pm and is filed under Books, Comic, Daily Rambles, Popular Culture. You can follow any responses to this entry through the RSS 2.0 feed. You can leave a response, or trackback from your own site. firstly. yay! for TCAF going annual. When I got the email from Chris I had to do a double take at the date cuz I know it takes a lot out of him and the Beguiling crew. But I’m so down for this as it’s THE BEST comic related even in Canada!!! And I LOVE Zafon!!! I wish I coulda been there!!! Confound it!! I KNOW! The TCAF thing does lead me to believe I have to up my game though- that is if I’m even going to potentially, maybe, try to get enough junk out there to have a table… one day.